The chance to dream – something designers are rarely offered in the name of productive work. Veronica Simpson uncovers some inspiring examples of schemes – even countries – that offer support for unfettered creativity. Imagine a world where, as designers, you didn't have to worry about the commercial value of what you are doing, just the quality of your ideas. Imagine being given -- for a period of time -- a basic income that covers your living costs so that you can explore and interrogate big ideas or perhaps tiny, life-changing shifts in design processes, technology or applications, whether to do with materials, the environment, or our relationship with the objects or spaces around us. There are occasions -- usually when some public body, university or arts organisation is involved -- when designers and architects get to do exactly this. But they are far from the norm. The kind of world where it is the norm would be very different to the one we're in. I recently stepped into a very different world -- not exactly the one described above, but with interesting parallels. I had the good fortune to be invited to Norway for the awarding of the 2015 Lorck Schive Art Prize. Launched in 2013, the aim of this biennial prize is to raise the profile of Norway's contemporary arts scene, throwing a spotlight on four shortlisted Norwegian artists of international renown, giving them the opportunity to create a specific work for the final exhibition at the Trondheim Kunstmuseum, and then handing over NOK500,000 (nearly £40,000), to the winner. I wasn't aware that Norway's arts scene needed such PR. Today's art market is a global one, and the galleries I visit are as likely to feature artists from Africa, China, Iceland and Japan as they are more home-grown talent. 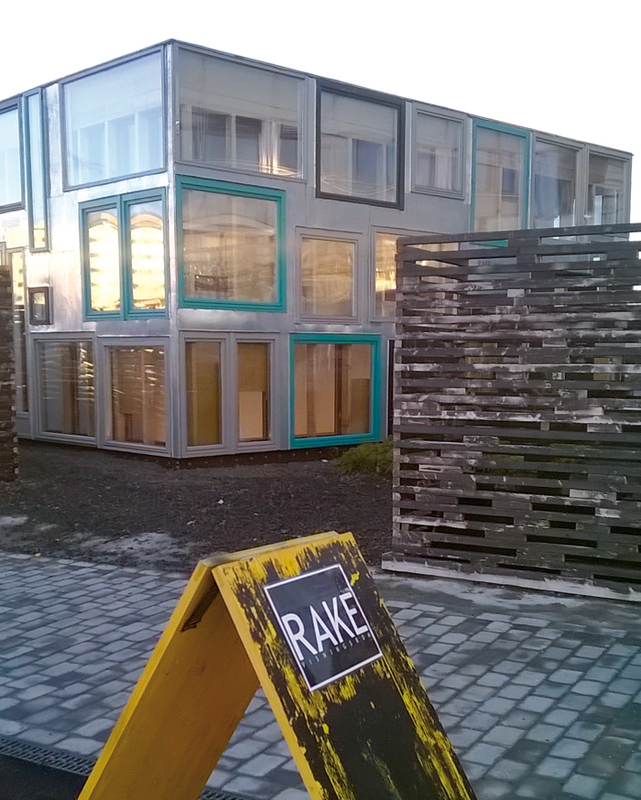 But Norway's is an unusual art scene, with almost no commercial galleries apart from a handful in Oslo. Instead, many artists are supported by grants from foundations such as the Lorck Schive Trust (it gives out many small grants to young and emerging artists). Many more are funded by the Norwegian government itself. Since a very vocal group of artist activists of the Seventies demanded more support and recognition (partly because Norway's oil boom led to a widespread belief that the profits should benefit Norway's citizens in general, including its artists) there has been a strong tradition of providing working grants for artists, as well as a guaranteed minimum income for established artists with a consistent and recognised body of work -- enough to provide for basic needs. This latter scheme was subsequently replaced by a 10-year grant, with various conditions. Having public funding doesn't necessarily make for great art, says Jonathan Watkins, director of Birmingham's IKON gallery, and one of the judges for the Lorck Schive prize. But he certainly isn't deriding the national talent pool. Vanessa Baird, a half-Glaswegian, half-Norwegian artist with an MA from the RCA, emerged as the winner, with a work that embraces big issues, both political and personal. 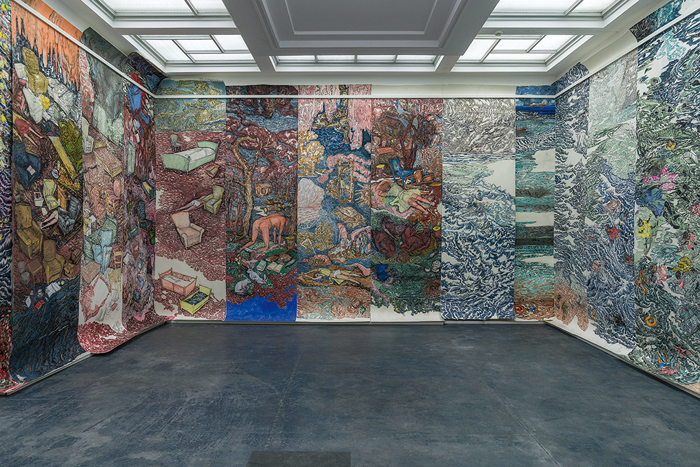 'I don't want to be anywhere but here I am,' offers a truly immersive experience of exterior and inner turmoil: 15 wallpaper rolls of intensely figured pastels depict beautifully rendered seas, forest and interior landscapes. But the seas are awash with drowning asylum seekers, the forest filled with warped nursery-story characters -- Goldilocks hanging by her neck from a tree; three drunken bears; a cluster of demonic gnomes -- and the claustrophobic domestic interiors appear to be collapsing: chairs, tables, half-eaten meals and discarded books tumble towards the floor, while half-naked or prostrate bodies lurk among the toppled furniture, their eyes and skin rendered exhausted or corpse-like. It is a powerful, visceral piece of work that could hold its own in any international exhibition space. Baird's interiors are directly inspired, she says, by her life -- as a busy single mother, with three teenagers, living in a small two-storey house along with her mother, her sister and her sister's kids. As a mother myself, I can relate to the dark side of her vistas, though the hostility and despair is shocking. But I realised that I was shocked partly because the interior life of a struggling mother is rarely depicted in art. Could that be because female artists of a certain age cannot maintain their commitment to such variably paid, energy and time consuming work, under the stress of raising kids? In a long conversation I enjoyed with her, Baird is very clear that the funding she received from the government's 10-year grant scheme in the first decade of parenting was crucial in helping to sustain and develop her art practice. The Norwegian system clearly demonstrates an admirable commitment to women artists in particular, and a belief in the importance of artists to society in general. In an increasingly irreligious world (or a world polarised between the atheist and the fundamentalist), artists occupy a key role for our collective conscience. We need them to hold a mirror up to our souls, revealing the grim, gory or occasionally glorious truth about contemporary human culture and behaviour. But design and architecture also offer vital skills that could be put to use in ways that might tangibly and practically improve the human condition, were the systems that support such idealistic endeavour in place. Around the world artists can access all kinds of residencies, fellowships and grants. Are there any equivalent opportunities for the core design disciplines? As luck would have it, shortly after returning from Norway I encountered Buro Happold partner Wolf Mangelsdorf, who, in summer 2014, was invited by modular-furniture brand USM to take a group of students he teaches at the AA plus some of his engineer colleagues to the Domaine de Boisbuchet creative retreat in France. During their week's brainstorming, he and his team developed a flexible, adaptable and viable system of modular mass-house building that Mangelsdorf is now developing as a vital and affordable antidote to the UK's costly and constipated house-construction programme. It turns out that the Domaine de Boisbuchet -- set up and run by Alexander von Vegesack, a founding-director of the Vitra Design Museum -- has been running inspirational, collaborative summer schools for designers and architects since 1990, offering tutored one or two-week courses (currently starting at £600 a week), on everything from film to lighting design. It may not be free, but with outcomes as inspirational as fast, fun and affordable housing solutions, it's surely a glowing demonstration of what can be achieved when the conditions are right for genuine blue-sky thinking.